With having so many of us we're never far away from a birthday in this household. Yesterday Joe was 8. 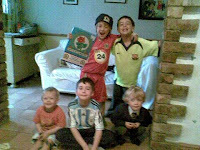 He wanted the Blackburn Rovers away kit more than anything else. I'm so amazed at his resilience and loyalty at sticking with Rovers. Most of his mates at school support Man Yoo with some boys sticking with City and Everton. Getting to go to matches helps and so does a relatively good season. Meeting a few of the players like Savage, Oojer and Bentley also made it harder to waver. Though I suspect Bellamy might have put him off for life. Obviously I'd love them whoever they supported - I'm married to a Burnley fan, afterall - but just how proud I am was summed up by a tale I heard this week. Mark Webb and Steve Wilson, two of our guys in the Leeds office, and long-suffering Newcastle United supporters, met a certain high profile Newcastle player who used to play for Rovers. Steve has had a bit of bother with one of his brood deciding to support Man Yoo. Our star - let's call him "Alan" (his real name) sympathised. One of his boys likes to wear an Arsenal shirt. Just goes to show. I started going to Rovers in 1977 because I could. But one of the many complexities of the football industry at the moment is that I think loyalty only goes so far these days if commitment stretches to watching your team on Sky and wearing a replica shirt. I'm so pleased that my nephew Ben has really got into watching Blackpool with his step Dad, and my brother-in-law, Dave Tinkler. It's been an exciting season for them and it might just stick with him. As for kits we only have a strict policy in our house. You can have any kit you like, as long as it's Rovers, Burnley, Spurs or foreign (see above). Also on the football front, Max and Louis are making their debut this morning for what will be the Marple Athletic Under 7's next season.